Hotel Lawyer with some bad news for the luxury hotel segment. From some reactions, you might think that the likely “End Of The Recession” by the end of 2009 means that the “Recovery” is close behind. Unfortunately, what follows next will not feel much better for many for a very long time. Nowhere is that more true than in the luxury hotel segment, where Smith Travel Research foresees a 27% drop in RevPAR for 2009 followed by another 9% in 2010! 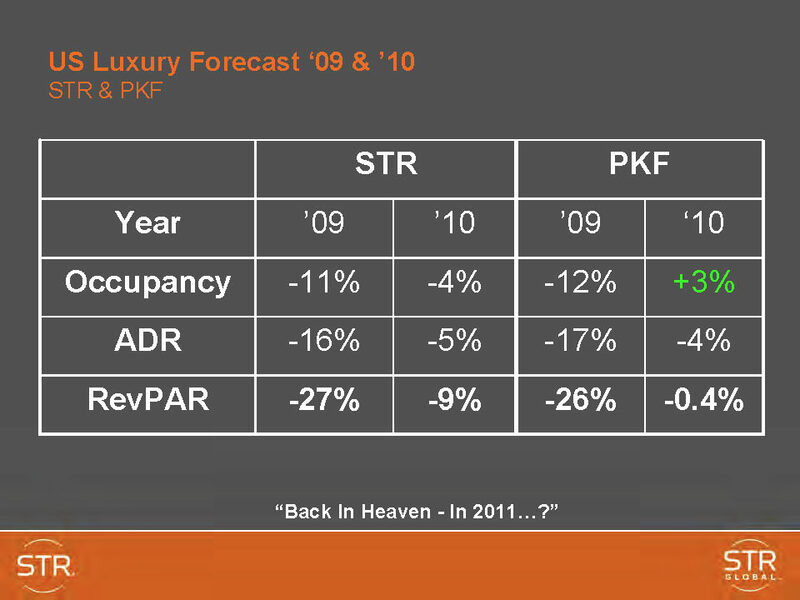 Here are a few of the most interesting slides from Smith Travel Research and other industry sources since August 20, 2009, focusing on the luxury hotel segment. How bad are things? How bad are they likely to get from here? Fasten your seat belt! For the last 70 years, at least since such records have been kept, the NOI of the hotel industry has never taken such a plunge. According to PKF, 2009 NOI for the entire hotel industry (all segments, all geographic regions) will fall nearly 40%, and it won’t start to improve until 2011 at the earliest. Most experts believe that average daily rate (ADR) cannot turn around until demand has recovered for a little bit. Moody’s doesn’t see a significant improvement in occupancy over the next 4 years. As of August 26, 2009, Moody’s senior analyst did not see occupancy recovering even to 2009 levels through that period. This is a very negative outlook for any hotel lender or owner. But the outlook is even worse for the luxury and full service segments of the hotel industry. Given the horrific 40% NOI declines suffered by the entire industry, it is painful to think that one segment might do even worse, but that is the prospect for the luxury segment from both Smith Travel Research and PKF. 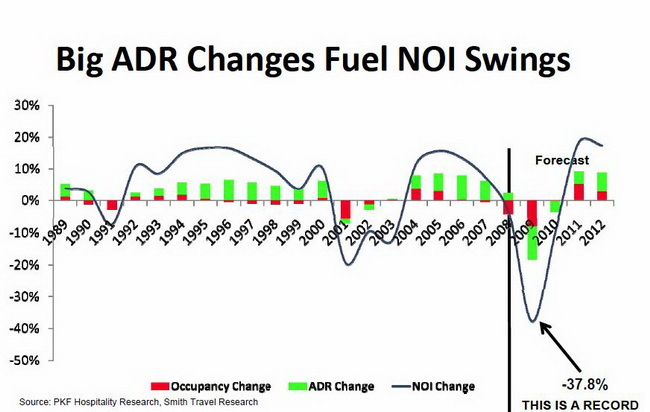 Smith Travel is projecting a -27% decline in RevPAR for 2009, followed by an additional -9% RevPAR decline in 2010. 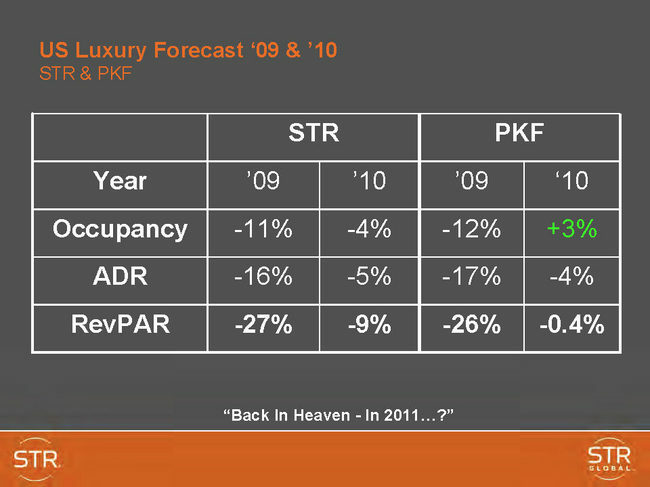 PKF is projecting only slightly more favorable numbers — a -26% decline in 2009 and a -0.4% decline in 2010 (based upon a 7% more optimistic view of occupancy in 2010). 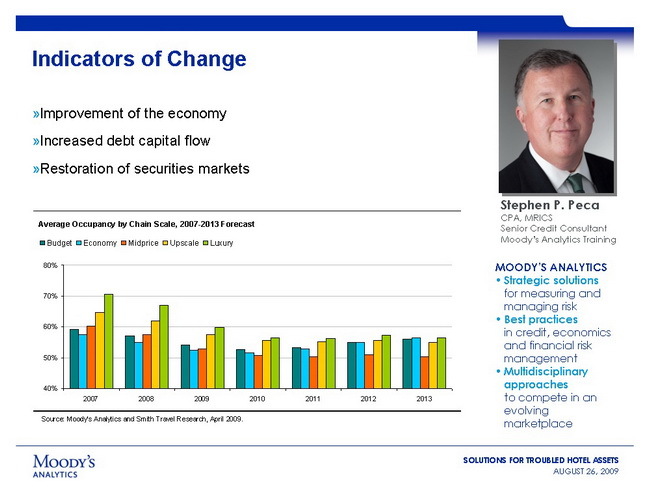 These views are summarized in the slide below. Smith Travel notes that in addition to the 10% supply increase in the number of luxury hotel rooms, there is another 5% supply increase under construction and a further 5% in the pipeline. That will mean more supply to absorb in the future when demand comes back. What does this all mean? What do you do as an owner or lender? Hotel values will come back. The only question is how long it takes, and the data is suggesting at least a minimum 3 to 4 year hold to get back to 2008-2009 levels. Who knows when we get back to peak values again. Before you go for the mothballs for that hotel, remember the analysis recommended in our recent article: “Closing that hotel may be the worst money-saving idea you ever had!”.